The wheel wells needed some accurizing as well. I cut out the moulded-in wheel wells and rounded out the opening somewhat (they seem a little oddly shaped to my eyes). I then lined them with .005′ plastic sheet, installed to go all the way in to meet the bottom side of the upper wings. I also added the two stiffening ribs; note that part of the inner rib actually protrudes from the top if the upper wing. General airframe additions included some added detail in the carburetor scoop opening and in the well for the tail wheel. Looking at my references, the carburetor opening had a half-moon-shaped plate in it. I added this from sheet plastic, and also added a backing plate and some micro screen in the opening, and painted all this before adding this front section to the scoop. The hollow tail wheel well was blanked off with a flat plate with suitable recess to house the tail wheel when retracted. Some authors refer to this piece as a mudguard. 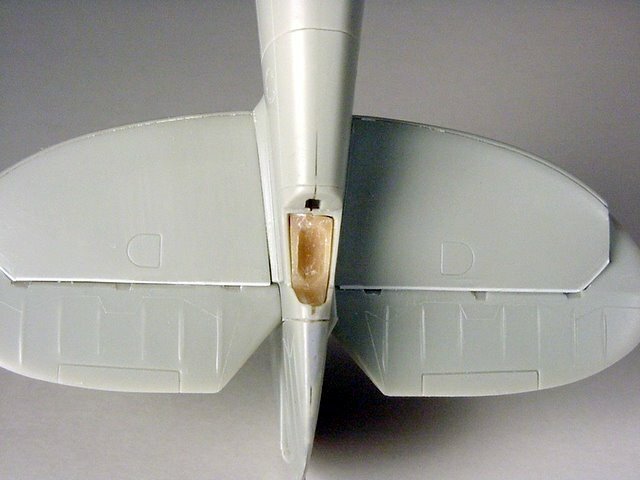 To produce the “mudguard” inside the tail wheel well, I shaped a bit of Sculpey modelling clay, fitted it into the opening, pushed the tail wheel into it to form the opening, and then baked the piece to harden it. It looks rough in the picture, but when painted, it looks the part. I separated the elevators from the horizontal tail pieces, refinished the edges, and re-installed them at about a 25 degree down angle; and yes, I did move the stick forward to match! I used the radiators from the KMC set, since they are about .030′ wider than the kit parts. They still fit the kit’s mounts, only the actual openings are wider and more to scale. I opened up the cooling flaps at the rear ends, made new flaps and actuators, and added more micro screen to the back of the resin pieces. I painted the insides of the radiators before installing them. During construction, I used Mr. Surfacer 500 to blend the joint lines of the engine cylinder head covers, the carburetor intake scoop, and the pressurization scoop. I used thin CA on the joint between the wings and fuselage, smoothing it all out and re-scribing panel lines as needed. If you want to do a PR conversion like this, check your references closely for the correct type of wheels. Flying well after WWII, my a/c had three-spoke wheels. The kit comes with four-spoke units. There are several pictures of PS852, Powles’ favorite, and her sister ship PS854 taken from their sojourn in Hong Kong. These two airplanes went through several paint scheme changes during this period. I depicted the aircraft as she was painted in early 1952, when Mr. Powles had his brush with the Grim Reaper near the Mach. The basic scheme is Medium Sea Grey (MSG) on all upper surfaces with PRU Blue on the bottom. The RAF type ‘D’ roundels appeared on the fuselage and upper wings only. A/c serial numbers were carried on the fuselage, and repeated on the bottom of the wings in black. 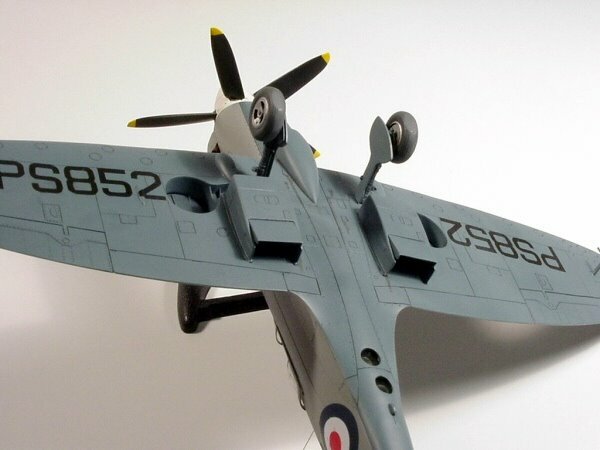 Note that the underwing serials are smaller than those seen on other late-Mark Spitfires. A black anti-glare panel was added down the nose in front of the cockpit, just covering the top edge of the Griffon engine’s cylinder head covers. Per Mr. Powles’ description, the aircraft wore a white spinner. The cockpit canopy framing was masked and painted British Interior Green, then completed in MSG; note that the windscreen frames and the front frame of the sliding section are painted black. The model was painted with Floquil and Model Master paints, thinned with Dio Sol. I added two thin coats of clear Future before decaling and another coat over the decals. The roundels and fin flash came from one of Aeromaster’s late mark Spitfire sheets, the serials from one of Extradecal’s RAF serial number sheets, and the underwing serials from Daco Products’ Belgian Spitfire codes and numbers sheet. I put a thin oil wash into the panel lines, fairly dark (Payne’s Gray) in the engine panels, control surfaces, other removable panels, and in the panel lines on the bottom of the a/c; and a slightly lighter shade in the top side lines. The effect is fairly subtle, which I believe is more accurate for this aircraft. A bit of exhaust streaking and a bit of silver paint chipping and wear on the wings (which doesn’t show much in the photos) were also added. .005′ steel wire was added for the whip antenna and the short aerial on the tail warning fairing below the fuselage to complete construction. The final touch was a semi-flat coat of clear acrylic paint. 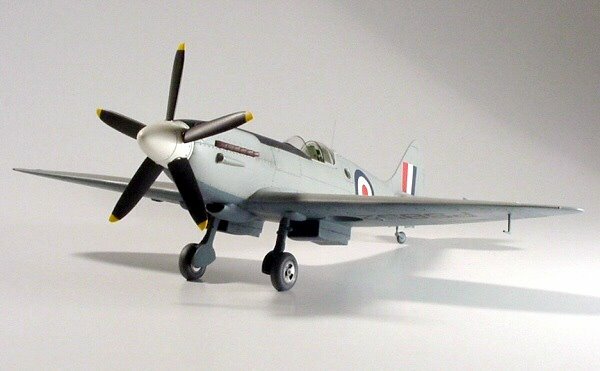 ‘Supermarine Spitfire PR Mk. XIX,’ by Theiner and Patek, published by MPM. ‘Wings of Fame’ quarterly, vol. 5, published by Aerospace Publishing, Ltd. The specific article is ‘Spitfire Spyplanes’ by Dr. Alfred Price. ‘Aeroplane’ magazine, from November and December 1998, articles written by Flt. Lt. Edward Powles. Interview with Mr. Powles to confirm markings. Supermarine Spitfire S-31 Walk Around, by Joachim Smith, IPMS Stockholm Magazine, August 1998. ‘Spitfire- In Action’, published by Squadron/Signal Publications. To Wally, for steering me onto this particular aircraft, and for introducing me to Mr. Ed Powles. To Roy Sutherland, Bruce Archer, Charles Metz, Paul Fontenoy, and others for their assistance during this project. I finished this model in 1999; in 2001 Airwaves released a PR XIX conversion set that may still be available. If so, it would make the project much easier!